To mark its 50th Anniversary, the Amon Carter Museum of American Art announces that it has acquired an important painting by Mary Cassatt, Woman Standing, Holding a Fan, created in 1878–79. The work is one of only two known canvases painted by the artist almost entirely in the medium of distemper and represents a key moment in her transformation into an Impressionist. Mary Cassatt (1844–1926) created the painting during a period of intense collaboration with French artist Edgar Degas (1834–1917) who invited her to exhibit with the Impressionists at the group’s fourth exhibition in 1879. Cassatt was the only American in the group, and with Marie Bracquemond (1841–1916) and Berthe Morisot (1841–1895), she became known as one of the “trois grandes dames” of Impressionism. In recognition of her contributions to the arts, France awarded her the Légion d’honneur in 1904. 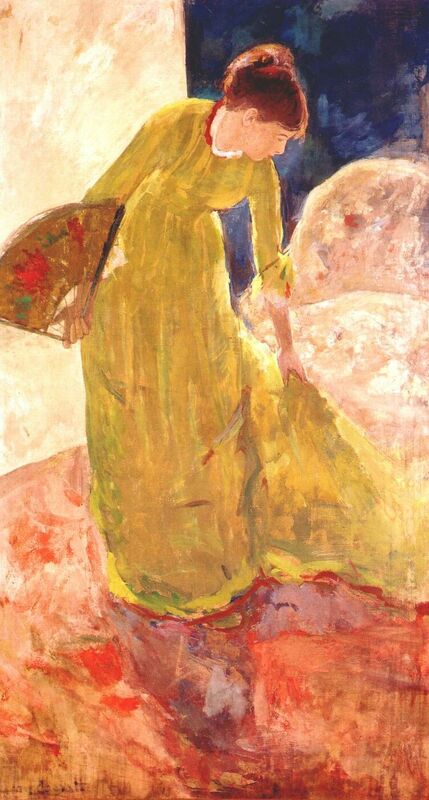 While she is known primarily for portraiture, Cassatt explored radical new styles and techniques to represent the modern world while working with Degas. Both artists were fascinated with natural and artificial illumination, along with the profound foreshortening and cropping of silhouetted figures. They also shared an interest in matte surfaces and the sketchy use of dry, chalky pigments, such as pastel and distemper, a medium in which pigments are mixed with water and glue. “Cassatt’s alliance with Degas, grounded in mutual admiration, produced some of the most closely linked and innovative art of the late 19th century,” says Rebecca Lawton, curator of paintings and sculpture at the Amon Carter. “Woman Standing is a perfect example of this. Cassatt, like many of her contemporaries, was fascinated by Japanese art. She devised compositional strategies by studying Japanese prints, learning how to depict character through posture and gesture and how to evoke an entire world using an economy of means. There are intriguing elements of mystery surrounding Woman Standing. Its first known owner was the celebrated art dealer and collector Ambroise Vollard. After leaving Vollard’s hands, the painting remained unknown to scholars until 1996, when it surfaced on the art market after residing for many years in a private French collection. Since then, the painting has been exhibited and published three times, but its place within Cassatt’s career and studio practice is not thoroughly understood. Its panel-like format suggests that it may have been conceived as a decorative scheme and thus belongs to a broader program of decorative ideas that were being discussed by the Impressionists in the late 1870s. Woman Standing, Holding a Fan is currently on view in the second-floor paintings and sculpture galleries. Born in Pittsburgh into an old, prosperous Pennsylvania family, Mary Cassatt received her primary artistic education at the Pennsylvania Academy of the Fine Arts in Philadelphia, which she entered in 1860. When she was 22, Cassatt went abroad, studying in Paris with renowned French masters that included Jean-Léon Gérôme (1824–1904) and Thomas Couture (1815–1879); by the mid-1870s she had settled in France permanently. Her friendships with Edgar Degas and Camille Pissarro (1830–1903) coincided with a transition in her work toward the dynamic brushwork and high-keyed colors of Impressionism. Cassatt devoted herself to portraiture—most frequently depicting women and children who were family and friends. The French Impressionists invited her to participate in their 1879 exhibition; thereafter, she moved comfortably within their circle, actively exhibiting and selling her paintings, pastels and prints. Around this time she also began producing etchings and drypoints, which would ultimately number more than 200. The Amon Carter also houses four of Cassatt’s prints. Daughter of museum founder Amon G. Carter (1879–1955), Ruth Carter Stevenson is the guiding force behind the development of the Amon Carter Museum of American Art. She has been president of the board of trustees since the museum was established in 1961, and it was she who engaged Philip Johnson (1906–2005) to design the original building, two subsequent additions and the 2001 expansion. She has personally helped in the formation of the museum’s collection with direct donations and energetic support of acquisitions through the Amon G. Carter Foundation; since 1982, she has also served as president of the foundation.